There is a one time carriage charge of £5.95 per order. Please note that we are only able to deliver within Mainland Britain excluding non industrial Scotland and BFPO addresses. How Long? 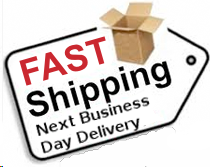 We use a next working day courier on all orders. Order before 13:00, excluding weekends and public holidays, and we'll despatch the same day. Whilst we pay for a next business day service unfortunately couriers do sometimes delay the process. Please note in instances where goods are delayed that at no time will compensation be awarded for the delay. Unless otherwise specified, all products must be signed for.